The annual D23 Expo has once again granted us “fantasmic” news! Walt Disney Animation Producer Roy Conli has recently announced that the heroic cast of Big Hero 6 will aid Sora in the battle of light against darkness! 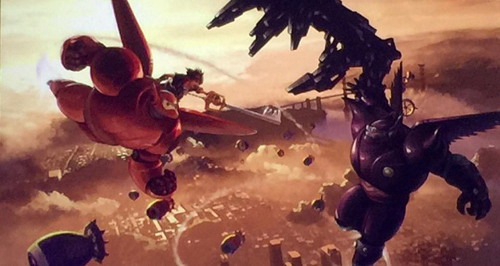 They were even fortunate enough to showcase Sora flying on top of Baymax against a Heartless form of Baymax. The Big Hero 6 scenario of Kingdom Hearts III will actually be the first world in the Kingdom Hearts series that will continue from where its motion picture counterpart left off. This means that when players reach the amazing world of San Fransokyo, Sora and company will be involved in events that take place after Big Hero 6. The concept art which you will see in the following video will explain that Xehanort and the powers of darkness exploit the Baymax left in the alternate dimension through the portal shown near the end of the film. Other than this big confirmation, it has also been confirmed that each new Keyblade in Kingdom Hearts III will have its own signature transformation mixed into the gameplay. This definitely opens up new avenues for gameplay that will revolutionize the future of action RPGs. That’s all for now but stay hooked with us at KH-Recharged, your resource for instant Kingdom Hearts news! We hope you are “satisfied with your care” with this news update.